This chapter introduces the migration of a Web-based cognitive tool (CT) for the generation of procedural knowledge about mathematical fractions from a desktop version to a mobile version. It aims to provide insight into the potential of human-computer interaction in mobile learning environments to encourage reciprocal tutoring and foster collaborative learning. A collaborative mobile learning environment is designed using a design-based research approach. A Web-based CT for learning the concept of fraction equivalence is improved and modified to suit the environment as applied to a mobile technology supported classroom. 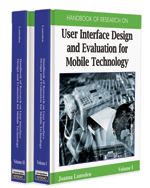 This chapter first delineates the theoretical design approach and empirical design methodology that underlie the migration exercise, and then discusses the architectural design of artifacts and the pedagogical design of learning activities to shed light on the development and application of mobile technology in a classroom learning environment. Affordances: Making available profitable spaces in which learners can interact in ways that meet their needs. Cognitive Tools: Mental and computational devices that can support, guide, and mediate the cognitive processes of learners. Procedural Knowledge: Knowledge that guides the performance of certain tasks in the absence of the knowledge that underlies the performance of the procedure. Collaborative Learning: A process that encourages learners to participate in coordinated and synchronous learning activities with a number of other learners. Mobile Learning: The use of mobile technology for learning and teaching. Cognitive Elaboration: The process of forming associations between new information and prior knowledge. Cognitive Conflict: A perceptual state in which one notices the discrepancy between an anomalous situation and a preconception.